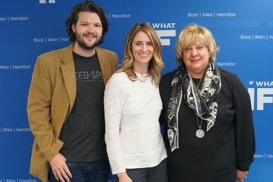 SEED SPOT and Booz Allen Hamilton are doubling down on their mission of supporting Washington, DC’s entrepreneurial ecosystem to spur startup innovation as a force for good. Their strategic partnership provides early-stage impact-driven entrepreneurs with business fundamentals, mentorship, resources, and access to capital to create businesses that positively impact the world. The Kauffman Foundation estimates that startup density is down 48 percent since 1977, SEED SPOT and Booz Allen Hamilton aim to build the entrepreneurial pipeline for women, military spouses, and all individuals in the District, Maryland, and Virginia to create a more robust economic future for the region. Their partnership combines SEED SPOT’s national track record and mission to empower communities to educate, accelerate, and invest in social entrepreneurs with Booz Allen’s century-long history of mentoring young innovators and creating solutions for global clients. SEED SPOT and Booz Allen are collaboratively supporting 60+ entrepreneurs from all backgrounds in the DC metropolitan area through comprehensive programming that turns their inspirational ideas into transformational business ventures. Over the next year, SEED SPOT will run numerous 2-Day Launch Camps and an eight-week Impact Accelerator. Entrepreneurs will refine their business models, build out financial projections, and perfect their pitches, which will be put to the test at a community-wide Demo Day in March 2019 to win over potential partners and investors. SEED SPOT’s social entrepreneurship curriculum has helped launch 421 entrepreneurs over the past five years, 49 percent of which are female founders and 45 percent of which are minority founders. These impressive entrepreneurs have gone on to raise over $10 million in capital, create 1,050 new jobs, and impact the lives of 2.2 million people across the country. Previous DC alumni include The Mentor Method, which has gained corporate clients by mentoring diverse tech talent, and Imby, whose Beta launched supporting four DC neighborhoods to give citizens a voice in local real estate development. “In today’s innovation ecosystem, we seek the collective ingenuity of our people and industry partners to bring forward transformational solutions to power resiliency and growth in communities,” said Booz Allen Executive Vice President and Chief Innovation Officer Susan Penfield, emphasizing the firm’s efforts to empower people within and outside the firm. “Through the 2-Day Launch Camp, Booz Allen is committed to investing in military spouse and women founders to give this underserved group an opportunity to disrupt industry through impactful program piloting and prototyping,” Penfield added. Booz Allen, a SEED SPOT Innovation Catalyst Partner, is providing highly-experienced employees that will serve as mentors for these up and coming changemakers. Their expertise in innovation, financial forecasting, and next-gen technology will be extremely valuable for the female, minority, and veteran entrepreneurs that this programming is creating onramps for. SEED SPOT’s first 2-Day Launch Camp will be on September 12-13. Register to participate today: http://bit.ly/SEEDSPOTDCLaunchCamp. To learn more about how SEED SPOT and Booz Allen are empowering entrepreneurs to change the world, click here.